It is an argument that inspires passion in every rink, sports bar and living room where hockey is being played or is on the television. It can incite elevated heart rates in person and long discussion threads on the Internet. NHL.com and NHL Network gathered 10 writers and television personalities and asked that very question. Each was asked to rank their top eight in eight categories -- centers, left wings, right wings, defensemen, goalies, coaches, general managers and guys who wore the No. 8 sweater. The voting, which took place for all eight segments in mid-February, is complete and the points have been tallied. 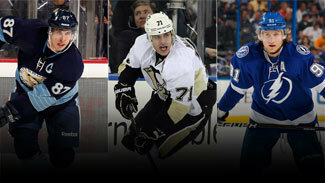 Here is our answer to the simple question, who are the best in the NHL? Center is the first position this series examines. In terms of star power, it is the deepest position in the League. Like with goaltenders, some teams are constantly scrambling to find their franchise center, while a couple of teams are blessed to have two. Narrowing the list of top centers down to eight is not an easy task. There are All-Stars, even Hall of Fame candidates, who did not make our list. What makes an elite center? Obviously they have to be the facilitator of great offense, but other factors -- two-way play, faceoffs and leadership -- come into play as well. If goalies are often compared to quarterbacks -- if a team doesn't have a great one, it can't win -- then No. 1 centers are like shortstops. They are almost always the best all-around hockey player on the club. Excellence in the postseason appears to have also been a big factor in the final rankings. Six of our top eight are Stanley Cup champions, and three have won Conn Smythe trophies. Here are the voting results. NOTE: A player received eight points for a first-place vote, seven for a second and so forth to one point for an eighth-place ranking (number of first-place votes in parenthesis). Crosby has been a phenomenon in the sport since before he was old enough to drive. His arrival in the National Hockey League was heralded the way Eric Lindros, Mario Lemieux and Wayne Gretzky were before him. "The Next One" and later "Sid the Kid" hasn't disappointed. He became the youngest scoring champion in League history and MVP in 2006-07. Two years later he was the youngest captain to win the Stanley Cup. A year later he scored the gold-medal winning goal for Canada at the 2010 Winter Olympics. The past two seasons were derailed by a long struggle to return from concussion symptoms after hits in back-to-back games in January 2011. He excelled when healthy enough to play last season, and is rolling again in 2012-13. "When healthy, as we are seeing now, I think he is by far and away the most complete player in the game, let alone center," NHL.com senior writer Dan Rosen said. "He is a threat to score or create a goal every time he is on the ice. He's never a defensive liability. He can play in every area in the offensive zone. He's fearless in front of the net. His stick skills are off the charts. He wins faceoffs, which creates puck possession, and then he makes plays to keep the Penguins on the attack. His vision is outstanding. And, he makes every player he plays with better. There is not another player in the game that combines all of that into their game. Crosby does." Among the superstars who have entered the League in the past eight seasons, Malkin has collected the most diverse set of hardware. He was the Calder Trophy winner in 2007, the Conn Smythe Trophy winner in 2009 and in 2012 he was the Hart Trophy winner and tournament MVP at the world championships -- amazing feats after missing the end of the 2010-11 campaign because of torn knee ligaments. "Geno" was the first player to score a goal in his first six NHL games since the first season of the League in 1917-18, and Malkin is a two-time scoring champion. If Malkin vs. Crosby doesn't start a good argument among hockey fans, put someone from Beaver Falls, Pa., and Falls Church, Va., in a room and let them debate the top two picks in the 2004 NHL Draft, Alex Ovechkin and Malkin. "It is a fine line that separates the top-two centers: Evgeni Malkin and Sidney Crosby," NHL.com Managing Editor Shawn Roarke said. "And, it is fair to say that line moves on a regular, if not nightly, basis. In the end, it basically comes down to what you value in a player. For me, the attraction has always been to power-type players over skill-type players. In no way is this to suggest that Crosby doesn't have a power element to its game; he does and it is underrated. But, Malkin is the prototypical power center when his game is in top gear. At his peak, he is a mixture of transcendent skill and brute power that is a nearly unstoppable." Stamkos is the best pure goal scorer in this group. He is a two-time Rocket Richard trophy winner, and last season became only the second player in the past 17 years to hit the 60-goal plateau. The first pick in the 2008 NHL Draft, Stamkos had a slow start to his rookie season but he's been an elite sniper since and is developing into a complete player. He has 170 goals since the start of his second season -- 42 more than the closest competitor. Stamkos is the only player on this list to not have played in a Stanley Cup Final, but he did help the Tampa Bay Lightning to within a win of the Final in 2011. If Crosby has drawn comparisons to Gretzky, and Malkin to Lemieux, then the closest player the NHL has to a modern-day Mark Messier is Toews. The No. 3 pick in the 2007 NHL Draft, he and Patrick Kane helped return hockey to prominence in Chicago. The year Toews had in 2009-10 alone was incredible. He was one of the top players for Canada en route to a gold medal at the 2010 Winter Olympics, captained the Blackhawks to a championship for the first time in 49 years and collected the Conn Smythe trophy. "Toews got the nod over Stamkos from me because of his 200-foot game," Rosen said. "This isn't to say that Stamkos doesn't play a 200-foot game, but Toews plays a better 200-foot game. If Toews and Stamkos were on the same team and the same line, there is no question in my mind that Toews would be the center and Stamkos would play on the wing. Toews is fast, elusive, tough and he plays with a great hockey IQ in that he reads plays in both ends of the ice. Stamkos is a pure scorer and undoubtedly one of the best players in the game, but Toews is a better overall center when it comes to handling the responsibilities of the position." One of the reasons Toews doesn't have a Selke Trophy is because this guy has three of them. While players like Crosby, Malkin and Stamkos are always in the discussion of "best player in the NHL," it is likely someone in the past few years would eventually say, "Don't forget about Datsyuk." He is one of the most skilled players in the sport. When other players make highlight-reel moves, they are compared to him -- a Dastyukian deke is one of the highest forms of flattery bestowed on a hockey play. At the height of his powers, Datsyuk had at least 87 points in four straight seasons and has still been a point-per-game guy the past two seasons but has missed time with injuries. "Placing Datsyuk that high was among the easier decisions for me," Roarke said. "I believe he is truly among the best centers in the League today. His points total may not rival what he accomplished at his peak, but he can still beat an opponent either through the creation of a goal or, just as likely, scoring it himself. His skill on the puck -- especially in tight places -- is almost unrivaled. And, most importantly, he is an elite two-way player, who may be just as valuable in his own end as he is in the attacking zone. I personally value two-way play perhaps more than any other trait." If Crosby isn't considered the best setup guy in the League, it is because the pass-first half of the Sedin twins probably is. Henrik has led the League in assists in each of the past three seasons, and won an Art Ross Trophy in 2009-10. The Sedins dealt with criticism early in their careers that they weren't going to reach superstar levels, and the Canucks couldn't be a Stanley Cup contender with them leading the way. Both of those arguments are long gone, and Vancouver did come within one win of a Cup in 2011. "It took him a good 4-5 years to develop, but his numbers since 2005-06 are impossible to ignore," NHL.com writer Dave Lozo said. "He's averaged more than a point per game and his vision and passing ability are by far the best in the NHL. He hasn't seen a dip in production in the postseason, either, and I imagine his perception among fans would be different if the Canucks would've won a fourth game against Boston. The fact he's played in 600 straight games speaks to his intelligence and durability." The first Slovenian to play in the NHL, Kopitar reached new heights in 2011-12. Always considered one of those guys in the next group of top centers below the truly elite ones, Kopitar won over any remaining critics during the 2012 Stanley Cup Playoffs. He was the best skater in the League during the course of two months as the Los Angeles Kings claimed the Cup for the first time, and Kopitar might have collected a Conn Smythe Trophy had Jonathan Quick not put forth one of the best goaltending runs in the history of the NHL. Detroit is the second team on our list with two franchise centers, and it shouldn't be surprising that the Red Wings and Penguins are the only teams with multiple appearances in the Final in the past eight seasons. Datsyuk and Zetterberg are the only two guys on our list who weren't among the first 11 players selected in their draft classes. Zetterberg was selected No. 210 in the 1999 NHL Draft -- in the current draft format he would have been the last guy chosen. Detroit won the Cup in 1998 and followed it up by selecting the eventual Conn Smythe Trophy winner a decade later. "Zetterberg is very much like Toews, only he is a bit older and has a lot more wear on his tires," Rosen said. "I gave him the nod over guys like John Tavares and Eric Staal because his two-way game is more refined than those guys and he's just as lethal in the offensive zone. He's the Red Wings so-called will guy, meaning he wills them to wins on nights when maybe they have no business being in the game. And, he's been doing it for a long time at a consistently high level." Others receiving votes: John Tavares (11 points), Joe Thornton (10), Claude Giroux (9), Eric Staal (6), Patrice Bergeron (1). If the voting was done in May instead of March, Tavares might have squeezed into the top eight. Tavares has been really good for the New York Islanders, but he's been a superstar in the early stages of the 2012-13 season. "John Tavares has never experienced the postseason and he hasn't been close in his three seasons," Lozo said. "But he's quietly improved every facet of his game and is on his way to becoming a top-five forward, not just a center, in the NHL. He has one of the best shots in the game, he can be a playmaker, he's strong enough to win puck battles along the wall, and he's doing it all with a very weak supporting cast. There are 100-point seasons in Tavares' future; it's just a matter of if they happen on Long Island or in Brooklyn." Giroux's coach Peter Laviolette famously called him the best player on the planet at the end of the first round of the playoffs last season, but only three voters see him as a top-eight center. Staal had plenty of support as a top-eight guy, but no one championed him higher than seventh. It says something about the strength of this list that Bergeron, one of the top two-way guys in the League and the 2011 version of Kopitar, received only one vote. Guys like Ryan Getzlaf, Nicklas Backstrom and Mikko Koivu didn't receive any. Thornton ended up with one of the most unique voting profiles on any of the eight top-eight lists. While Staal was named by five people, Thornton was ranked in the top eight by only two -- Lozo and NHL Network analyst Barry Melrose. "You are probably a bitter Bostonian if you don't consider Thornton an elite center," Lozo said. "He's closing in on 1,100 points in 1,100 games, is still just 33, and if you want some insight on how he makes his linemates better, ask Jonathan Cheechoo or Devin Setoguchi about it. He had two poor postseasons in Boston -- one when he was 18 and one when he played with a broken rib in 2004. An unfair narrative about Thornton not being a 'winner' shouldn't distract you from the fact he's been a game-changer for a decade."